We followed the windy, maze-like streets into Guadalupe Cartago leading up to our final destination, The Hogar Jesus de los Manos. Along the way, we chatted happily and the energy in the van was quite high. Everyone was excited and we all couldn’t wait to arrive. A new member of the Costa Rica CCS team had joined us, Santi, who was just as alive and cheerful as the volunteers. As the Program Assistant, Santi works hand and hand with Jose and typically accompanies the volunteers to the site each day. 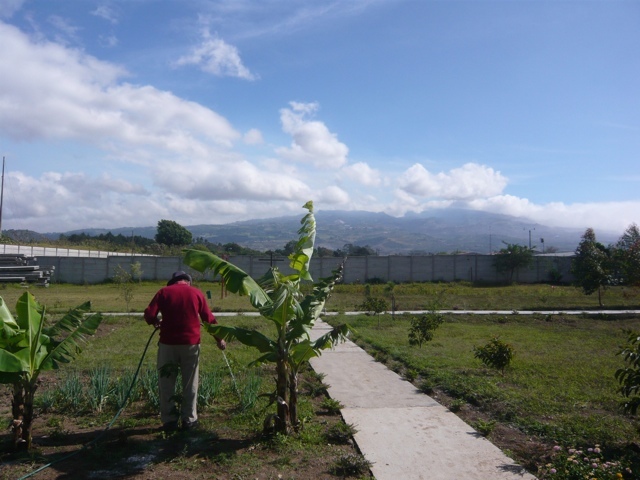 There are two other CCS volunteer sites in Costa Rica, in different areas of the country, so Jose cannot be with the Cartago group all the time. He frequently travels to the other offices to check up on the volunteers and see how they are doing. Santi was an equally knowledgable and compassionate replacement and we were delighted to have him with us and we especially enjoyed all his laughs. 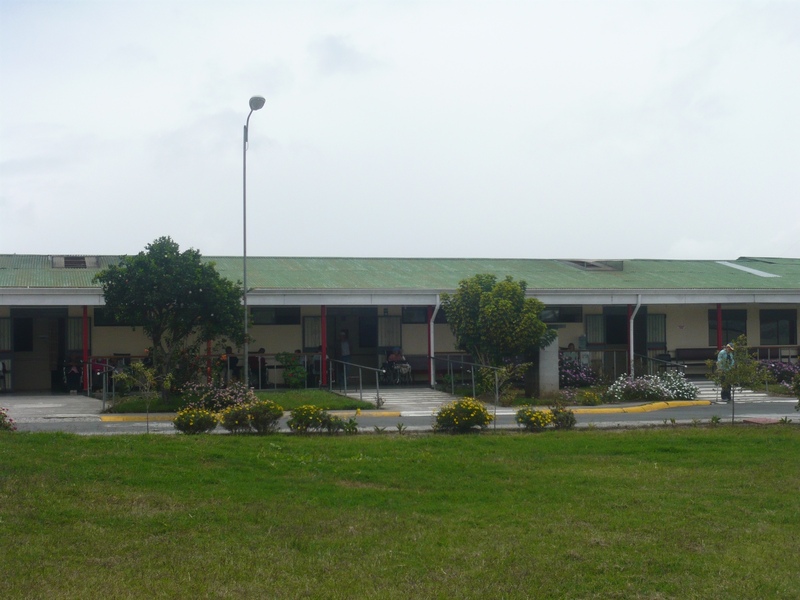 Santi told us that the nursing home was created in 1992 as an NGO that provides loving care and assistance to abandoned and abused elderly Costa Ricans that have no family or other place to go. Like most Costa Ricans, the residents are highly catholic and their faith plays a large role in their life and viewpoints. We were also prepared with some details on the residents before we arrived. About half of them were disabled and in wheelchairs, a few were mentally incapacitated, and a few were on their “last days” as Santi put it. We had to prepare ourselves to deal with anything but most of all, to give compassion, understanding and companionship to them. They were desperately lonely and isolated despite the excellent care of the staff. They were craving attention, fun, entertainment and simply someone to talk to who would listen to their stories. That was all we had to do. We pulled up to the big wrought-iron gate and Santi buzzed the security (something we were getting use to in Costa Rica). We waited anxiously for the gates to open and the van to be let in. From a distance, we could see them; all thirty-two residents lined up in chairs or wheelchairs along the outdoor terraces on the L-shaped building. They were there, just as anxious as us, awaiting our arrival. My stomach dropped and anxiety raced through my veins. They are waiting for us! I realized in shock and disbelief. Then fear set in. How would I relate to them? I barely even speak Spanish. I have no experience with the elderly save my 95-year-old Grandfather who was one-of-a-kind. And even more nervously I thought, What if they found me a nuisance. Someone who couldn’t speak a lick of their language, a privileged American who didn’t have a clue? Then what would I do? What would I do if I failed? I didn’t have time to answer that thought because before I knew it the gates opened and in we walked. We were instantly met and greeted by Eduardo, the thirtyish-looking Director of the home. I could tell instantly that I would like him. He was confident, yet extremely humble and caring. He looked everyone in the eye when introduced and you could really tell that he gave a damn. We didn’t have much if any time to prepare for our introductions to the residents who were all desperately awaiting our arrival. All 32 pairs of eyes were on us as we walked down the long corridor and one by one, were introduced to every single Abuela and Abuelo at Jesus de los Manos. Eduardo made the introductions, lovingly placing his hands on each resident’s back and bending inwards close so that they could hear him speak. It was amazing. The compassion. The warmth. The love. The respect that Eduardo showed these people was unbelievable. I was completely taken aback. This is a good place I realized, in awe. Picture of the long, L-shaped corridor, lined with outdoor terraces for the residents to enjoy nature. I was also amazed and relieved to see how the residents reacted to our arrival. They were like little kids in a candy shop. The smiles, the boisterous talk and even the hugs of a few, made us all feel instantly welcomed and at home. I couldn’t believe how quickly they accepted us. They drank us up, every last drop, like an ice-cold drink on a summer hot day. Ok then, no worries about us not making any impact I instantly believed. It was going to be possible to make a difference. After the introductions of each resident and staff member of the home, we moved on to a brief tour of the grounds and the home itself. The building wasn’t the least bit modern yet it wasn’t as rundown as I had imagined. Of course before you visit a place you, you always conjure up images and perceptions of what it is going to be like. Well, this place was only slightly what I had imagined. The rooms were fine; minimally furnished but clean. Each resident had their own space which was nice. There was a huge room used for entertainment (music, dance, birthdays, etc) and there was also another large room adjacent that was set up with card tables and chairs where the residents could do activities such as color, paint or socialize. In the corner of that room, there was equipment for physical therapy sessions as well. At the end of the L-shaped corridor was a large dining room lined with long tables and chairs. Finally, the upstairs of the building contained more bedrooms and an office space for the staff. 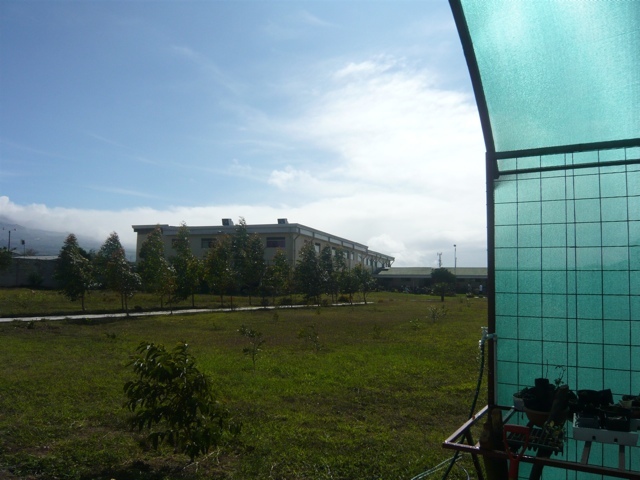 The best part of all about Hogar Jesus de los Manos was the location. The building was inside a walled-in lot set within the perfectly, lush and serene Central Valley. Nature surrounded you once you were outside, which explains why the residents spent much of their day outdoors on the terrace relaxing in the sun and gentle breeze. View of the green-blue mountains could be seen in the distance and the far end of the courtyard contained a large garden where residents could grow and tend plants and flowers. It was lovely and so incredibly peaceful. A perfect place to age (if there can be one). After our tour, Eduardo spent a short amount of time listing the objectives for the week. The most important thing we could help with was the residents. Since the Jesus de los Manos was a non-profit organization, its funds were very limited meaning they had an extremely small staff for all the residents. Just taking care of the residents required almost all their time so unfortunately the residents often got a bit bored and depressed. That was where the CCS volunteers as well as other volunteer organizations could help. They could entertain the residents. Talk to them. Play ball with them (yes, just like the ball I play with my young children; tossing a ball back and forth). Color pictures with them. Make jewelry or art with them. And for the ladies, give them manicures and pedicures! (Yes beauty is very important in Costa Rica and the women absolutely loved having their nails done!). Eduardo decided to split up the volunteers into two groups: One group would work with the residents and the other group would work on the grounds. They desperately needed some gardening and planting to be done in order to beautify the landscape. I chose the path of least residence, perhaps, for the first day and opted to do the dirty work: Gardening. We dug out weeds, planting flowers and tried to straighten things out in a garden that probably had not been touched in weeks. Some of the residents adore gardening yet needed help with it. That was where we stepped in to help their aging, arthritic hands to tend to the garden. It was a relaxing way to spend the first morning. Outside, with the gentle breeze coming off the mountains and touching my face. With a few, attentive residents smiling at everything we said (which they probably couldn’t understand). But sometimes smiles and gestures can mean much more than words, I discovered. Another thing I enjoyed that morning was one resident, an elderly man perhaps in his eighties, especially enjoyed to water the garden. He spent hours watering the flowers and tending to the garden, never saying a word but with a smile in his eyes. He wore a white floppy hat, long-gray pants and a red sweater, and every morning when we arrived, he was out tending the garden. It was quite special. The morning passed quickly and before I knew it, we said our goodbyes to our newly made friends and were loaded up in the vans. We heard the distant protests from some of the residents not wanting us to leave yet but they understood we’d be back tomorrow morning. We heard from Eduardo that day two was going to involve some other activities. Rumor had it that the ladies wanted a special treat. They wanted manicures and pedicures. They wanted to look “pretty” and feel young. The men, meanwhile, were looking forward to playing more ball and perhaps having a dance with the female volunteers. Once a man, always a man.